After rocking the world of fashion in 1989 with her sleek nylon handbags and her ready to wear collection, Prada designer Miuccia Prada brought a new dimension to The House of Prada in 1992 with the introduction of her designer fashion label Miu Miu. 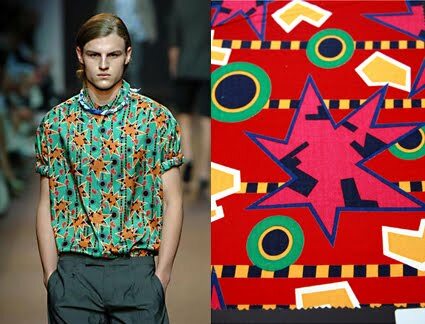 Focusing more on strong color combinations and bold prints, the Miu Miu label has allowed Miuccia to explore new youthful design motifs that frequently contradict the classic lines of Prada. 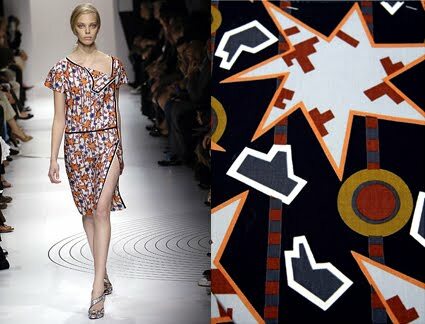 For Miu Miu's 2006 Spring line Miuccia didn't have to look far from her label's home base of Milan for inspiration. Revisiting the patterns and fabric designs of The Memphis Design Group from the early 1980's, Miuccia brought the bold powerful look of Memphis to the runway. Below are images taken from the 2006 Spring line fashion show in Milan, to the right of each image is a sample fabric designed by Nathalie du Pasquier in 1981-1983 for The Memphis Design Group that shows the direct correlation to Miuccia Prada's Miu Miu 2006 Spring line. 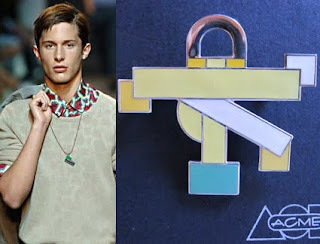 Miuccia also paired many of her Miu Miu male models with jewelry for the show that were very Memphis in design. The image above shows one of the models from the show compared with the Ettore Sottsass "San Marco" Brooch from 1985. 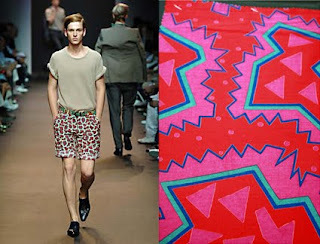 We would like to thank Memphis collector Dennis Zanone for the use of his Nathalie du Pasquier Memphis fabric patterns. For available Authentic Memphis Jewelry Designs please feel free to visit our website.